In 2004, Etienne Bourgois, a keen sailor with a few sailing trips to the Arctic and the North Pole under his belt, made a remarkable purchase. Over to him went the ownership of a boat called “Seamaster” which had lost its own master - Sir Peter Blake - boating champion turned eco-warrior when he was tragically murdered by pirates in the Amazon delta, on a trip to raise awareness for the environment in 2001. Christening the boat “Tara V” in his boating family tradition (Tara meaning “celestial path” in Maori), Bourgois was to continue to pursue the boat’s destiny. Tara, aka Seamaster, aka Antarctica had been purpose built in 1989 by Michel Franco, on behalf of the explorer Jean-Louis Etienne specifically to be able to drift in pack ice: its shell of aluminium hardens with the lower temperatures (steel becomes brittle and brakes), its hull is egg shaped so as to not offer any grip; hence ice closing in will lift rather than break the boat. 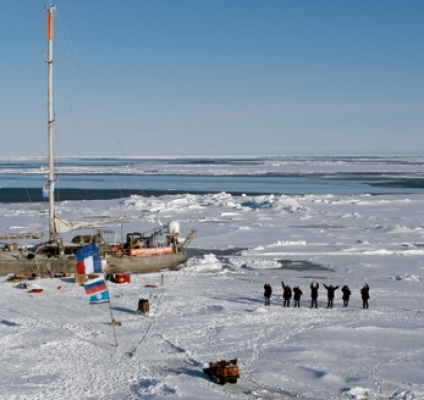 Loyal to both previous owner’s objectives Bourgois restored the vessel with the help of Jean Collet, her first ever captain in her life as Antarctica and conceived the master plan “Tara Arctic 2007/2008”. 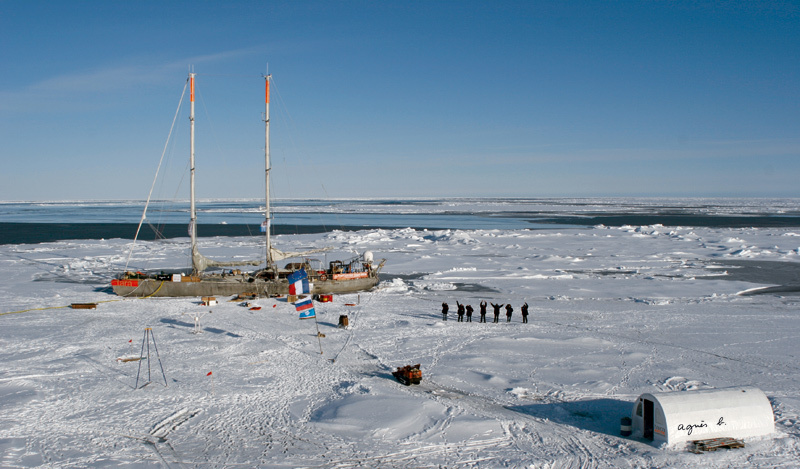 During the International Polar Year (March ‘07-March ‘08) Tara would go the Nansen way: as the Fram did in 1893-1895, Tara would drift across the North Pole slowly edged along by the ice in motion. All the while she would lend its pole position to research on global warming as part of the European Union’s Damocles programme (Developing Arctic Modelling and Observing Capabilities for Long Term Environmental Studies). Is the perennial Arctic ice in the process of disappearing and why? To find the answer to these two questions is the aim of the Damocles project with its research lab stationed on and around Tara. Etienne Bourgois’ “other life” makes him director of Agnes b worldwide since 1980. Son of Agnes Troublé herself, he is also here to stay – and propel forward what his mother began and what they share. With his spirit and passion he brings great operational experience and management skills crucial for such an operation. 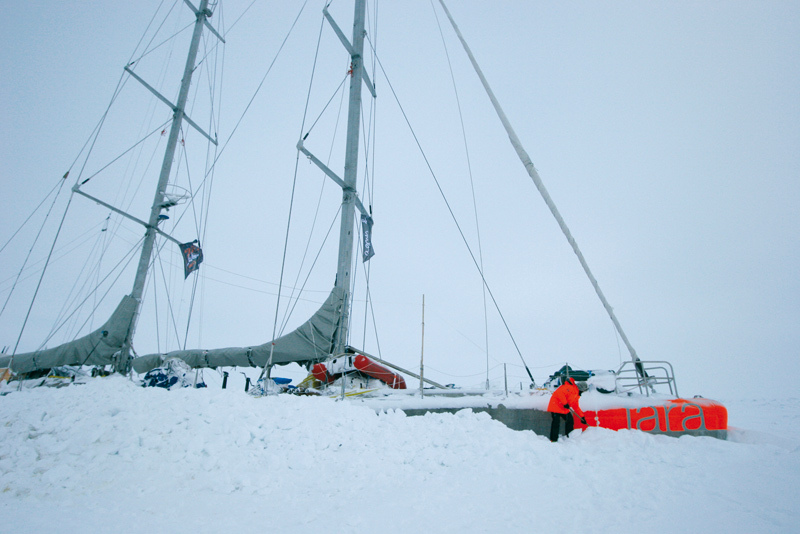 A company very engaged in humanitarian and environmental issues, Agnes b is the formal partner and main sponsor of “Tara Arctic” followed by UNEP / United Nations Environment Programme (unep.org). Expedition partner/entrepreneur-explorer Bernard Buiges forms the interface to Russian authorities, supply and support systems. Already known for larger scale undertakings, in 1999 he famously airlifted a 33 tons - ice block containing a 23000-year-old woolly Jarkov mammoth frozen in the Siberian permafrost. The onboard team are eight experts in winter and ten in summer aged from 23 and 53, holed up on the ice for six months at a time - apart from two who are going for the whole two-year drift - with the long-distance company of the Paris based ground team. So far there are two female team members on board, “which isn’t even numbers - yet, but a start…” we quote Bourgois. 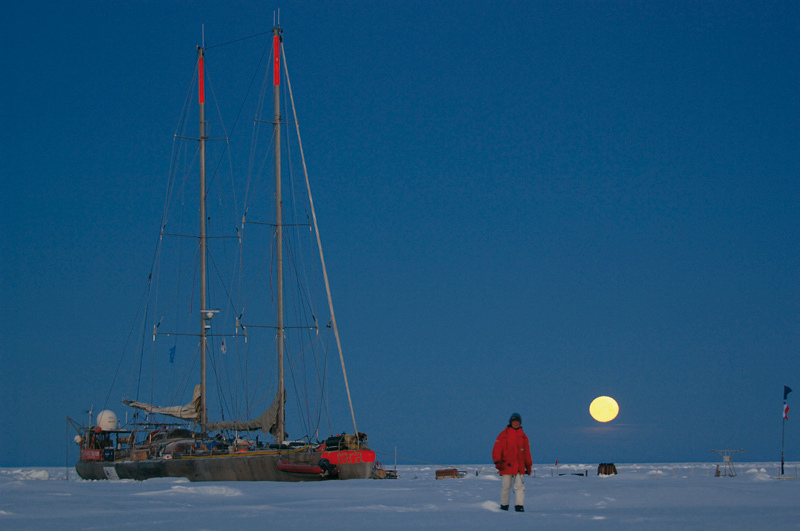 During the period of preparatory expedition planning in 2004 Tara went on exploratory trips to remote shores of Greenland, followed by South Georgia in the Australian Ocean as a destination which allowed a group of deaf people from the association “Les montaignes du silence” (Mountains of Silence) to land on the island and renew Sir Ernest Shackleton’s crossing. In 2005 artists were invited on board: Sebastiao Salgado used it as a base to write a chapter of his Genesis project, and contemporary artists including Pierre Huygue and Xavier Veilhan got a chance to sail along the Antarctic Peninsula, before back in South Georgia, the British Antarctic Survey was carried out from Tara’s decks. Early 2006 Etienne Bourgois and Jean Collet validated all technical choices and equipment by way of cruising through the Patagonia Canals. On July 11 2006 Tara set sail for the Great North, and was docked onto the pack ice at 81º northern latitude on September 4th. On September 8th the icebreaker and accompanying helicopters left the crew in the sole company of snow, ice and wind for their adventure. On October 18th the last ray of sun was seen, until some five months later the light began to make its reluctant come back on March 4. In the meantime, at intervals nights turned to day as the moon and its reflection were guiding the expedition and its exploration. While only a select few will have the life changing on/off-board experiences, the rest of us will gladly benefit from the results of this awe-inspiring and groundbreaking work. While the North Pole’s pack ice has gradually reduced in surface by 10% in the past thirty years, its depth has been reduced by some 40% in the same period. We know that the polar bear is facing its extinction through losing its habitat, starting with the hunting grounds (not being able to compete in the water, polar bears catch seal and birds when “jumping on ice”). This past year three incidences of cannibalism between polar bears have already been recorded. With the melting of the ice more boats frequent the area as new shipping routes open. Debris from boats drifting in water freezes onto the ice when temperatures drop. While all white surroundings reflect the sun, these patches don’t and consequently burn holes into the ice, resulting in a “Swiss cheese effect”. As alerted by the ACIA (Arctic Climate Report, 2004), the permafrost (Siberia, some parts of North America, Northern Arctic Polar Circle) is turning into mud. It is already happening now in some parts of the year: trees uproot and fall (sink), while houses collapse. Without the protection of the ice, shorelines are attacked directly by land bound storms. Villages disappear as the ground gets swept away by the sea. At a temperature rise of 3-5% the permafrost thaw will release enormous quantities of captive carbon monoxide and methane: the two main vectors of the greenhouse effect. The ice is formed by salt water but the salt sinks with time: the older the ice, the more thoroughly it is sweet / drinking water. Greenland is covered by more than 3km of thick ice mass, the outcome of thousands of years of precipitation: the world’s largest reserve of drinking water. It is already losing over one hundred billion tons of fresh water per year according to satellite observations - due to the collateral damage of global and an accelerated ice slide into the sea. If 10% of Greenland melts the sea level will rise 10% - a Greenland melt down would mean a rise of 7m. Moreover, the change of balance between fresh and saline water risks the modifying and even stopping the “North Atlantic Drift” which would drastically cool off the Scandinavian coasts. Global warming could cause glaciation. As paradoxical as it sounds, it is a possibility: it already happened once between 9000 BC and 8500 BC. WHICH MESSAGE DOES TARA WANT TO CONVEY? Mi ha anche detto che c'erano piu dubbi su quello che sentiva per me, che levitra 20 mg precio generico forse erano svenuti prima questi dubbi e fosse finita per bene alla luce di acquisto cialis napoli questi dubbi. -per quanto riguarda l'astinenza, perche non considerare una vita propecia acquisto on line di coppia senza sessualita se e solo se entrambi i membri della coppia sono OK. come acquistare viagra pfizer in caso contrario, squilibrio, risentimento e frustrazione non manchera di verificarsi. Se da una parte c’è la donna che potrebbe dove acquistare viagra in italia sentirsi rifiutata, o comunque non del tutto accettata dal partner, dall’altra c’è l’uomo che rischia di sentirsi “escluso” e non in grado di far sentire a proprio agio la sua lei. Antico testo sanscrito dedicato a regole di condotta matrimoniale, cialis 20 mg prezzo farmacia divenuto famoso per la parte dedicata alle posizioni dell’amplesso e per i consigli sulle pratiche sessuali. In situazioni di salute non costituisce viagra acquisto in contrassegno pratica igienicamente pericolosa.